The Federal Reserve Board recently released its Report on the Economic Well-Being of U.S. Households. The report provides results from the Board’s 2013 survey of households on topics that include household finances, housing and living arrangements, student loan debt, retirement, and health expenses. Respondents to the survey were asked a series of questions relevant to the housing market. 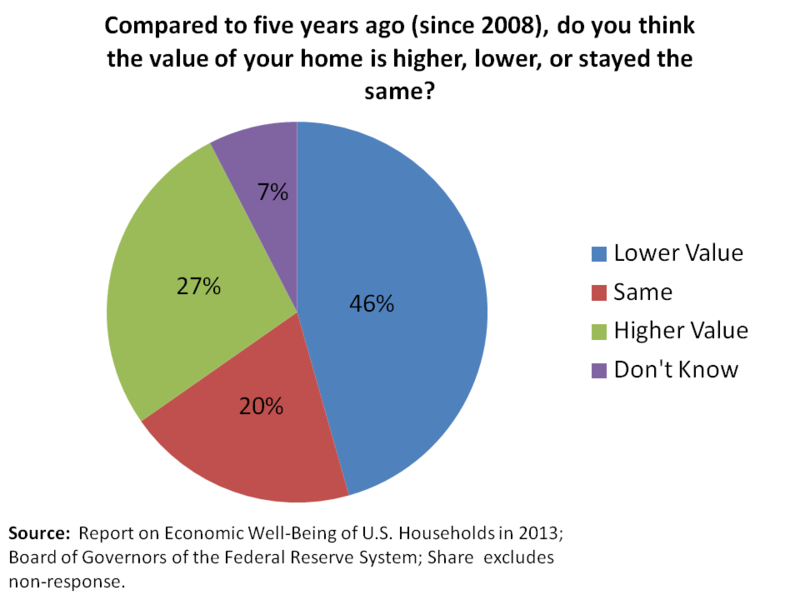 A significant share (46%) of households thought the value of their home was lower than the value in 2008. The results highlight the recent boom and bust of the housing market but may also highlight a recovery. For example, a slightly larger share (47%) thought the value of their home was the same (20%) or higher (27%) than the value in 2008. Signs of a recovery or perhaps stabilization in home prices were also evident in responses about expectations of home prices in the future. In the next 12 months, 40% thought home prices in their neighborhood would increase while 37% thought prices would stay the same. 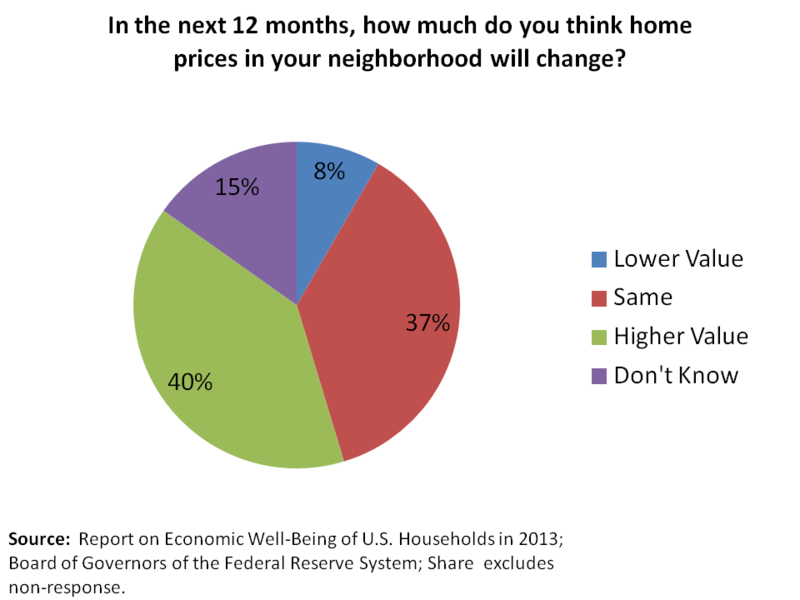 Only 8% of respondents thought home prices in their neighborhood would be lower. The survey also provided information on the economic well-being of renters. 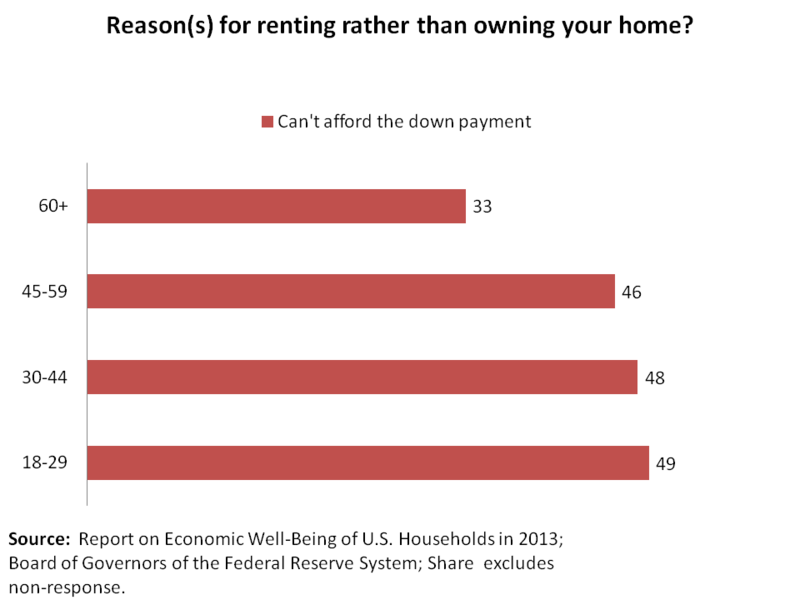 Renters were asked to indicate all reasons for renting rather than owning. The age group with the largest share of renters indicating that they could not afford the down payment was 18 to 29 years at 49%. This age group has been in the workforce for the least amount of time and has therefore had more limited time to save for a down payment. The share of respondents indicating that they could not afford the down payment decreases by age group. The age group with the largest share of renters indicating that they could not qualify for a mortgage was 45 to 59 years at 41%. The share from this age group indicating that they could not qualify for a mortgage was significantly higher than all other age groups. The age group with the second largest share of renter’s indicating that they could not qualify for a mortgage was 30 to 44 years at 28%. The results from the annual survey provide a snapshot of the economic well-being of homeowners and renters. Over the last five years many homeowners saw a decline in home prices. However, the decline in home prices was followed by a rebound that many expect to continue during the next twelve months. Renters were not affected in the same way as homeowners but tighter access to credit makes it more difficult for the transition to homeownership. 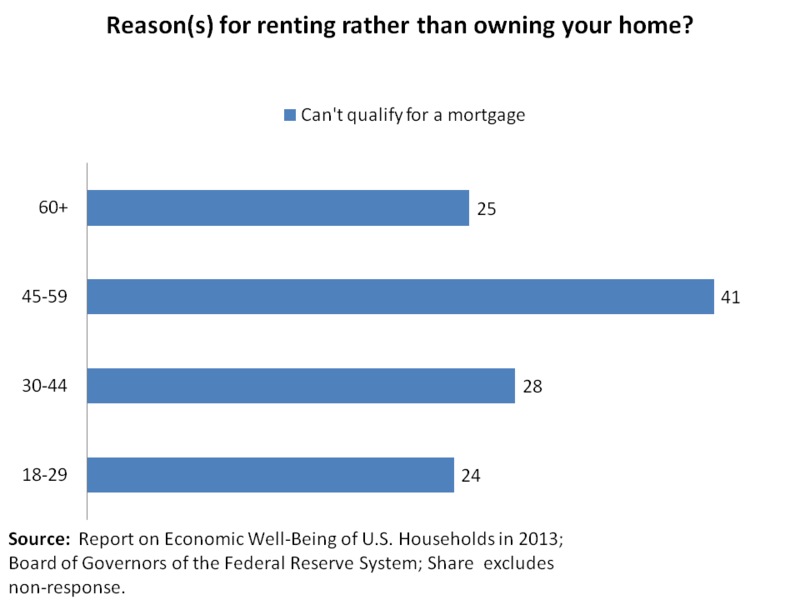 This is suggested in the number of renters responding that the reason for renting is because they can’t afford the down payment or can’t qualify for a mortgage.